If you want to shoot a big buck, you need to get it onto your property. In this era of food plots and property management, deer will choose to go to the setup that’s best. BB2 is your secret weapon. Its powerful aroma, the result of a proprietary refining process, draws deer from farther away. 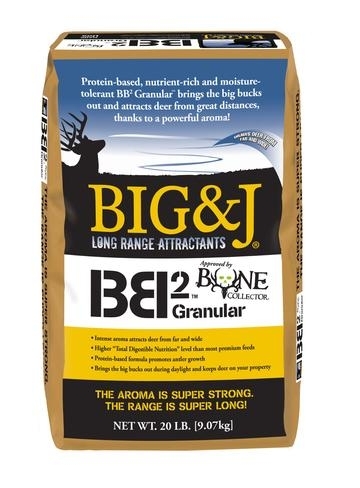 But BB2 is not just an attractant. In fact, it has a TDN (total digestible nutrition) level that is higher than virtually all premium feeds. And a high level of protein. This brings the big bucks out and keeps deer coming back all season long. During pre-season, use BB2 to establish travel patterns and acclimate deer to your property. By middle to late summer, use BB2 to attract deer to your camera sites to inventory your bucks. In season, use BB2 to bring the big bucks out during shooting hours and to keep all deer on your property.